Federal insolvency laws can be misused and almost no one seems to care. I’ve seen it up-close in Canada and studied it happening in Australia. The U.K. is not immune. The recent Coffee Republic administration as reported by the BBC fits this model very closely. Insolvency is supposed to be a way for corporations to survive without the disruption of bankruptcy. Insolvency/administration was never meant to enable a franchisor from cynically breaking 100% of its franchisees’ and landlords’ contracts while lining the pockets of the legal and integrated accounting firms. I have seen this up close in 2001 (Country Style) and continue to see this maneuver today in cases such as Kleenmaid in Australia. A franchisor (aided by his very skilled lawyer) creates 3 or 4 corporations: one holds the lease, one the franchise agreements, maybe an opertation one and one for equipment. They then stage a financial crisis in the companies that you want to shed (like a snake) and then keep the assets to be “sold” by a friendly accounting/consulting/trustee. The circle is completed with the secured creditors (mostly franchise industry specialist bankers who are wise to the scheme), vote to accept the offer of presented by the trustee from a “miraculous” hand-picked white knight new investor. Speed is good in this case so as to Cool out the Mark. Oddly enough, often the new franchisor is related to the old franchsior. The pretense of an economic downturn helps confuse the naive. So it goes in franchising: the Franchisor sheds his inconvenient debt while his Courtiers make breathtakingly massive fees for advising and carrying out the charade. The landlords (with luck) get 11 cents on the $ for their multi-year, specialized construction-based commercial leases. Word to the Wise Landlord: You should have taken the shake-down offer you got before the trigger was pulled on this scam. Professor Jenny Buchan on behalf of the Australia CPA goes into detail in her paper called When the Franchsior Fails. An excellent primer on what happens when the franchisor falls on their sword: by accident or intent. This entry was posted on Tuesday, July 21st, 2009 at 2:35 pm and is filed under Intentional insolvency, Lawyers as businesspeople. You can follow any responses to this entry through the RSS 2.0 feed. You can leave a response, or trackback from your own site. 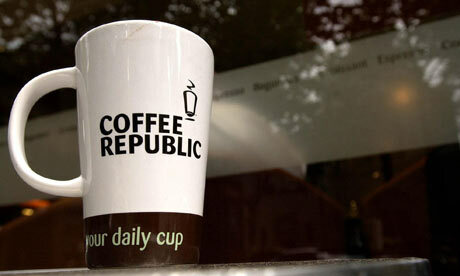 3 Responses to Coffee Republic UK: a dirty insolvency, lease burning party and flip to a brother-in-law? It is interesting to hear about this, as yet another corporate entity is able to shrug off their debt, while the average Joe is drowning in theirs. It seems so biased that in the wake of the banking meltdown, yet again it is the little man who is left to struggle on their own, while businesses can worm their way out – ready to rise from the proverbial ashes ready to hold out their hands to consumerist Britain/USA. I wonder when – if ever – the rights and needs of the individual will be so readily catered for. The current market climate is a very convenient pretense for much accounting “housecleaning” by corporations. I would, however, not forget the critical contribution by the the legal, accounting, consulting and bankruptcy professionals. Without the “fixers” most management teams lack the necessary vision and technical prowess to accomplish this sleight of hand. The best defence is being within a group that accesses a comparable degree of expertise. I have also tried to educate people by creating WikidFranchise.org which is useful in providing a framework and some examples of common shenanigans. Indeed, you have hit the nail on the head, as without the shirttails of their wily accounting and legal team to hide behind, most of these corporations would be stuck with the dilemma facing so many during the current climate, without being able to ‘sneak out the back door’ as such. And regarding your site, I am suitably impressed and look forward to reading at my leisure. Great idea. It is difficult to get a man to understand something when his job depends on not understanding it.